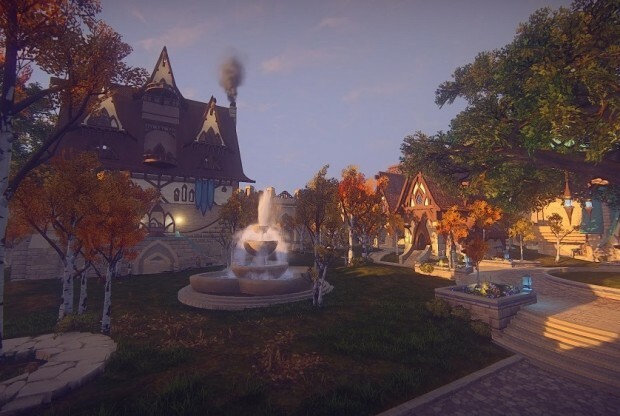 Landmark and EverQuest Next Senior Producer Terry Michaels penned a producer’s letter on the forums today, saying primarily that while the dev team will be working hard on additional material for the two games, communication might be a bit more infrequent than what players are used to. While much of the focus has shifted toward building tools for EverQuest Next, Landmark will still get attention and updates/hotfixes as needed. Despite this shift, though, Michaels confirms that EQN will not be releasing in any form this year. That’s a bit of a bummer, but hardly unexpected, for as little solid info as we’ve had on the game since last year’s SOE Live. And with no such show planned this year, it gives Daybreak the chance to devote all their resources toward building for something big in 2016. Here we go you guys..sony’s infamous legacy lives on even when they’re not handling the game anymore. “SOON”, they said. EverQuest Producers can grab hands whit NCSOFT’s Blade & Soul Team and go to hell! Future of mmos, delay game till it becomes outdated. New game appears, play the waiting game, gets outdated. never mind, as long as they make it great, i won’t mind them take their time as long as they want. agreed. So many games now adays release their games so early in a buggy state that they earn themselves a bad stigma and kill their playbase. Or that early access crap. If they’re going to release this game next year they might just have a chance, good MMO’s are going here this year, like, Black Desert Online, WIldstar going F2P, Skyforge, and I beleive Overwatch, also Armored Warfare. quote me on that one. So it’ll be hard for them to debut this year, next year might be a good idea though. Next year they will have Star Citizen , Albion online , Crowfall, Kingdon Come :Deliverance to compete with. I gave up on Everquest Next took too long the Hype is gone for me.